The architectural firm that is today CDS International began in 1958 as Hogan and Chapman Architects, occupying a small office on Beretania Street in Honolulu. Partners George Hogan and Donald Chapman brought with them extensive experience in residential design and high hopes for making their mark with larger projects. By 1963, the staff had grown to eight and the firm relocated to a building of its own design, at 250 Ward Avenue. The work had expanded in variety as well as volume, with country clubs, city parks, and industrial facilities dominating the firm’s portfolio. In 1966, the firm designed its first high-rise, the American Savings and Loan building, located at 1600 Kapiolani Avenue. Better known to locals as the Pan Am Building, this project met with broad public approval, and launched Hogan and Chapman’s still young firm into the larger playing field of office buildings. 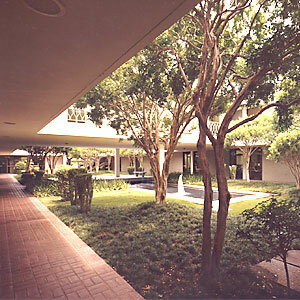 By the 1970s, the firm had grown to 18 staff members and become Hogan, Chapman, Cobeen and Weitz, Inc. With its roots still planted firmly in residential design, the firm’s workload also comprised shopping centers, hotels, schools, libraries, office buildings, industrial complexes, apartments, and military facilities. In 1977-78, two significant events in the firm’s evolution occurred: Pravin Desai, the “D” in CDS, became a principal of the firm; and work began on an historic project: the Arizona Memorial Visitor Center at Pearl Harbor. Among the many honors this project received is the prestigious Blue Seal Award for the most outstanding design of 1980, awarded by the US Secretary of Defense. The next five years saw a few departures and the promotion of Carol Sakata to principal in 1979. By 1983, the company name had become Chapman Desai Sakata, Inc., or CDS. The staff of more than 30 included seven registered architects, a certified interior designer, a certified specifications writer, a construction administrator, a graphic designer, and 12 drafting staff. The following year the firm took up residence in one of its proudest achievements-the 28-story Pauahi Tower, part of the Bishop Square office building complex in downtown Honolulu. This award-winning project includes Tamarind Park, an urban oasis that has become the very heart of Honolulu’s business district. 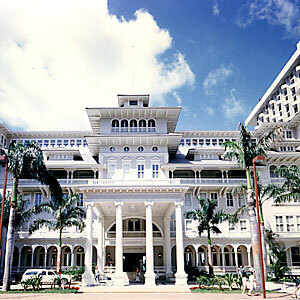 In the late 1980s, the firm’s work centered on hotel and resort projects, including the $328 million Grand Wailea Resort and Spa on Maui and the Historic Rehabilitation of the Moana Hotel in Waikiki, which garnered a dozen local, regional and national awards. During Hawai‘i’s economic stagnation in the 1990s, CDS focused on the government sector, designing a number of projects for the US Navy, the Army and Air Force Exchange Service, and the State of Hawai‘i. These projects included aircraft hangars, military operations facilities, housing, shopping centers, schools, a public library, and a major study of Honolulu International Airport’s intra-terminal transportation system. In 2000, Richard Balcom became a principal in the firm. In 2004, Glenn Miura, who had left several years earlier to pursue teaching and other interests, returned, solidifying the partnership of Sakata, Balcom and Miura that defines CDS International today. Over half a century-through several partnership iterations, periods of growth and change, and hundreds of successful projects-CDS International has never wavered in its core commitments to creativity, efficiency, responsibility and client satisfaction.